I've read this book more times than any other King novel to date aside from The Shining and The Stand. One would think my enamoration with this 1975 novel about vampires taking over a small town in Maine would lessen or die down due to reading it so many times, but in fact I always find more things to love about it. It just never gets old for me. While Carrie introduced the reading world to a young Stephen King, it didn't quite show the showstopping qualities of his writing -- while mostly successful, it was very obviously a debut novel by a young writer trying to find his way. In contrast, 'Salem's Lot -- published only one year after his debut novel -- shows Stephen King wielding his storytelling skills like a veteran. This book is the first that uses a couple of tropes King would use again and again in his subsequent stories -- namely, examining a town at large and the people who live there, and having a writer as a lead character. As far as King's large books about small town life go I'd say this one is definitely up there, beat only by Needful Things (a true masterstroke I can't wait to visit again in this reread series), and Ben Mears, while not one of King's most memorable writer characters, is highly sympathetic and realistic and fun to read about. One thing that always stands out to me about this book is King's ability to be completely patient in his writing, allowing the story to unspool at a leisurely pace before knocking the lights out and going for the jugular (so to speak) a little over halfway into the novel. Most writers -- especially young writers -- would probably let it out before page 50 that the strange men who have recently come to the small town of 'salem's Lot are vampires and slowly killing off the townspeople one by one. Sure, vamprism is hinted at briefly once or twice early on, but King definitely keeps his audience on their toes before -- finally -- reaching the big reveal. And my, I think the book is twenty times better for it. 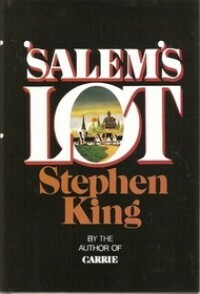 As well, this book contains some of the scariest scenes Stephen King has ever written that don't take place in the Overlook Hotel -- Danny Glick at the window, Ben having to drive a stake through Susan's heart, Marjorie Glick's body rising in the funeral home, the scenes in the Marsten House, the vampire kids in the bus.... I'm getting chills just typing this! It isn't hyperbole when I say the first time I read the infamous "window scene" I couldn't look out my window at night for almost a week. Like much of this novel, it's a scene with more implications than actual happenings -- the reader is allowed to conjure up the horrors in his or her own head. King doesn't spell out everything, and I think that's best. Written in a post-Vietnam, post-Watergate era, 'Salem's Lot is a pessimistic and horrorific look at small-town life, acting as a sly commentary on the American dream, or lack thereof, in the mid-70s. Because of this, it feels a little old-fashioned in places but King is a writer of his time -- he tends to capture what life is like in any time period and this book is no different. Taken on that level -- or taken as simply a scary vampire story, which it is -- 'Salem's Lot is a highly rewarding read, showing a young Stephen King already blowing the doors off and revealing to the horror literature world at large who's boss.